This Mushroom, Chicken, & Rice Pilaf recipe is an adaptation of my Fuel Pull recipe, Pork Tenderloin With Mushroom Gravy. The gravy is SO good, I didn’t want to change a thing about it, but I switched up the meat and turned it into a Trim Healthy Mama-friendly E pilaf by adding in some brown rice and carrots. You can also serve this Mushroom, Chicken & Rice Pilaf deconstructed. Dutch people have a habit of mixing all the food on their plate into a “prakje,” but if you want a different presentation of the same recipe, you can also serve the chicken and mushroom sauce over a bed of rice and serve your carrots on the side. The nice thing about serving this dish as a pilaf, is that you can make it ahead of time, freeze or refrigerate, and re-heat, covered. This is a great recipe to use up leftover cooked chicken in, but if you don’t have any on hand, it’s easy enough to cook up 4 breasts. I cook my chicken breasts, covered, on a stone bar pan at 450 for 20 minutes. Cooking them at a higher temperature for a shorter amount of time sears in the juices and leaves the meat moist and succulent instead of dry. Cooking them on stone removes the need for excess fat in a recipe; you don’t need to oil a seasoned stone at all. These are ideal pans for E meals! The gravy is meant to flavor both the brown rice and meat its served over, so there’s no need to glorify the rice any other way. I chose to use steamed carrots in this dish because they fit nicely with an E meal and they add plenty of color and vitamins, but you can also use peas, green beans, broccoli, or maybe a little corn. This Mushroom, Chicken, & Rice Pilaf is a delicious, filling, Trim Healthy Mama-friendly E dinner that's low in fat, and high in flavor! Heat butter in a large saucepan. Saute onions until soft. Add mushrooms, thyme, salt and pepper, and saute until mushrooms shrink and brown. Pour in chicken broth, stirring to scrape up any brown bits. Add in cooked chicken. Cook for 5 minutes. Stir in parsley and xanthum gum until xanthum gum is completely dissolved and sauce is thickened. Option 1: Spoon over brown rice and serve with a side of carrots. Option 2: Remove from heat, and stir in cooked brown rice and steamed carrots. Spread into a 9x13" pan and cover with foil. Refrigerate or freeze until needed. Pre-heat oven to 350 F and reheat, covered for 30 minutes. 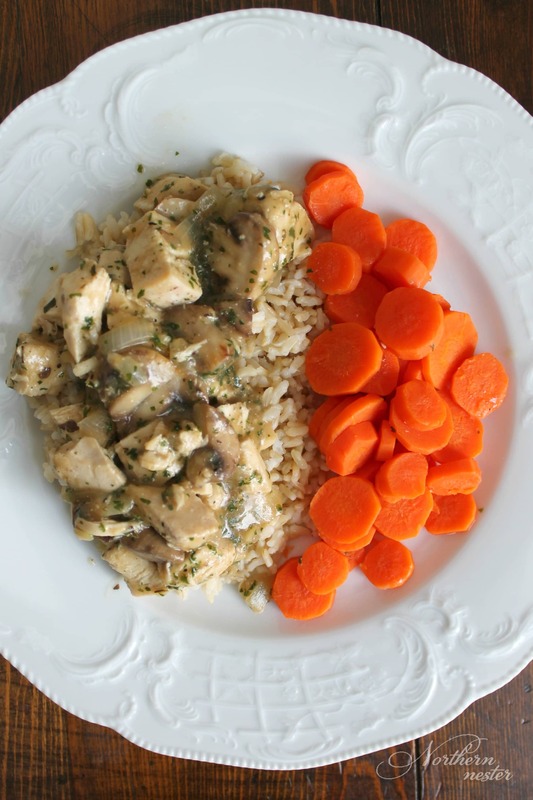 You can also serve this Mushroom, Chicken & Rice Pilaf deconstructed, by pouring the chicken and mushroom sauce over a bed of rice with carrots on the side. probably make this deconstructed. But this is definitely on my to make list, THIS week. For those local, I have kefir grains available. $10 will give you grains to culture your own homemade milk kefir indefinitely at the cost of your choice of milk. These grains are offsprings of originals from an unknown time… They’ve fed my family kefir for at least five years! You can use milk from cows, goats, coconuts, almonds, etc. and turn it into kefir in 24 hours, more probiotic than store-bought brands. It’s so simple! Instructions are included, but you can’t go wrong. It’s almost fail-proof. I’m new to the Instant Pot, but would like to make this in it. Any recommendations for coking this in an Instant Pot? Hi Rachel, I don’t have an Instant Pot, so I’m not sure how to help you, but maybe someone in an IP group might be able to help? All the best with it! Can you have a salad with this? You bet! Just try to keep the overall fat in your meal to 5 grams or approx. 1 tsp. I made this tonight (just been on THM exactly one week today) – it was absolutely DELICIOUS! I served it deconstructed because of time constraint but I’m sure it would be excellent that way as well! So glad you enjoyed it, Barbara! Thus looks so good! Could thus be done in a crock pot? My oven is in need if repairs. I’m new to THM so still figuring things out. Could I use cornstarch in place of the xanthum gum? This looks very good. Any alternatives to the mushrooms in this dish?